Choose from a wide range of seats, stools and benches all designed to meet different needs but with the aim of making any bathroom environment safe and comfortable. Made with a stainless-steel core, vinyl and ABS to provide superior durability and styling. Designed specifically for wet environments, seats and benches are available as free standing or can be affixed permanently to walls. Free-Standing Stool (G01JDS41): Has nylon slats and made of zinc-plated steel pipe, coated with antimicrobial, biocompatible, warm-to-the-touch vinyl. Max. 330 lb. load capacity. Fold-Down Shower Seats (4FAUHS01 and 4FAUHS02): Manufactured from ABS plastic and structurally re-enforced with steel piping to give it strength and rigidity. Internal friction plates operate the seats lowering and raising, safely preventing crashing down. Max. 450 lb. load capacity. 4FAUHS02 comes with legs. Removable Hanging Shower Seat (G02JDS01): Seat with nylon slats is made of zinc-plated steel pipe, coated with biocompatible, warm-to-the-touch vinyl. Max. 330 lb. load capacity. Use with Steel Grab Bar (G02JAS03). Sold separately. Rectangular Double Folding Shower Seat w/Nylon Slats (G02JDS22): Made of zinc-plated steel pipe, coated with antimicrobial, biocompatible, warm-to-the-touch vinyl. Max. 450 lb. load capacity. Double Folding Shower Seat w/Phenolic Top (G25JDS22): Rectangular shower seat manufactured with heavy duty coated frame and phenolic platform. Max. 450 lb. load capacity. 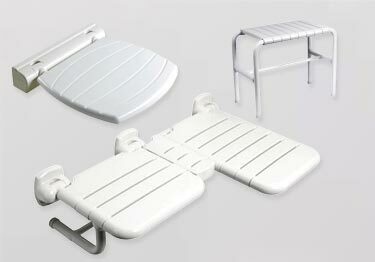 L-Shaped Double Folding Shower Seat (G02JDL30 and G02JDR30): Choose from Left or Right configuration. Double folding seat with nylon slats is made of zinc-plated steel pipe, coated with antimicrobial, biocompatible, warm-to-the-touch vinyl. Max. 450 lb. load capacity. L-Shaped Double Folding Shower Seat w/Spacer (G02JDL29 and G02JDR29): Choose from Left or Right configuration. Double folding seat with nylon slats is made of zinc-plated steel pipe, coated with antimicrobial, biocompatible, warm-to-the-touch vinyl. Max. 450 lb. load capacity. Bathtub Folding Bench (G02JDS18 and G02JDS19): Available in 2 sizes, the bench features nylon slats and is made of zinc-plated steel pipe, coated with biocompatible, warm-to-the-touch vinyl. Max. 450 lb. load capacity. Bathub Folding Bench w/Phenolic Top (G25JDS18 and G25JDS19): Available in 2 sizes, the bench is manufactured with heavy duty coated frame and phenolic platform. Max. 450 lb. load capacity. Reversible L-Shaped Double Folding Shower Seat w/Folding Legs and Phenolic Top (G55JDS33): L-shaped double folding shower seat, is made of HPL (High Pressure Laminate) and has stainless steel legs for added support. Wall anchor is secured by two stainless steel plates protected by a polyamide cover. Choose from a wide range of seats, stools and benches all designed to meet different needs but with the aim of making any bathroom environment safe and comfortable. Made with a stainless-steel core, vinyl and ABS to provide superior durability and styling. Straight or curved shower curtain rods & curtain hooks. 60", 72" & 84" rods & 5 styles of curtain hooks available.